Two side load letter trays, and a tray with a 3 compartment drawer. Upright section has Five 2 compartments. Approximate Dimensions (in inches): 15.25 W X 10.25 H X 13.25 D.
A filing crate made of sturdy metal mesh with a classic black finish. Perfect for holding file folders as well as other items in your home or office. Designed to fold up for easy and convenient storage when not in use. 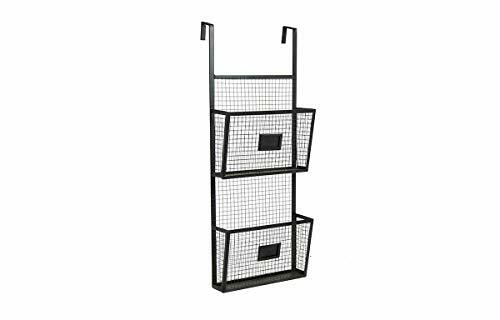 This mesh steel desktop hanging file organizer from U Brands is durably constructed from the black mesh steel, which provides not only function at your office, but also adds style and a modern design element to your personal space. Easily hang letter size hanging file folders and have instant access to your most important documents in your office. 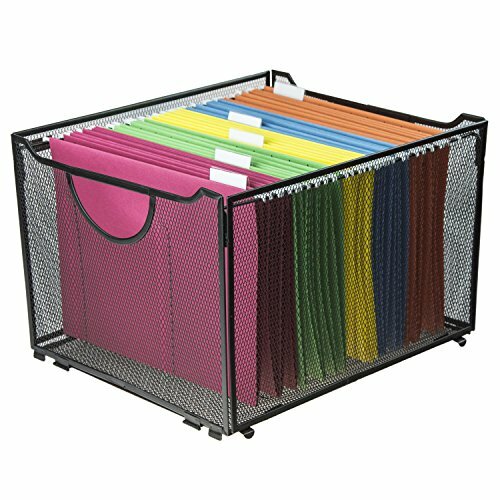 The mesh file holder is also a great accessory to store catalogs, manuals, magazines of various sizes without the hanging file folders. The desktop file organizer measures 12.4" wide, 9.75" tall and 5.5" deep. 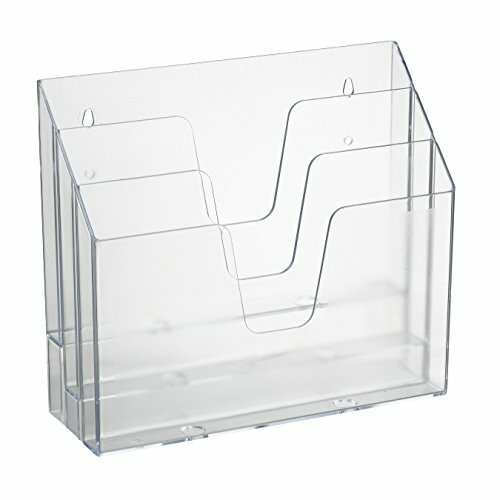 Match this mesh desk organizer with other mesh desk accessories from U Brands to organize and accessorize your office! Endless Possibilities: Need effigcient storage in your kitchen or bathroom ? The wall mountable racks are perfect for your pantry food, potatoes and onions. Let your produce breathe so it lasts longer and saves you money with this kitchen storage basket . But that's not all, you can use it any space you need extra storage, great for organizing your garage, kid's room or school supplies. Disorganized? We've got a solution for you, never misplace and lose an important file or document ever again. Say goodbye to being messy and clumsy, finish tasks faster when everything is organized in adequate fashion and within reach. Great Gift Idea: The desktop organizer makes the perfect gift for a housewarming or Christmas, you can get one for your co-worker, friend, family member or anyone who needs an organizational wall hanging to tidy up. 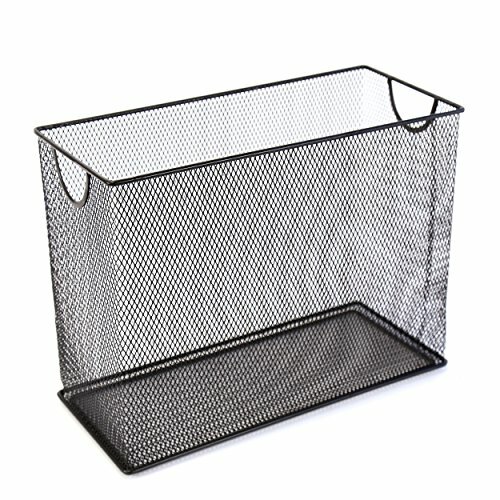 The Office Desktop Organizer Wire Basket Rack Will Help You To: Clear the mess sitting on your desktop, work more productively by keeping the things you need close at hand, within reach and easy to find. Product Dimensions: L 17" W 5" H 6 1/2" Each Compartment: 8 1/2"
1 Desktop Organizer Wire Rack with Compartments and Mounting Hardware. 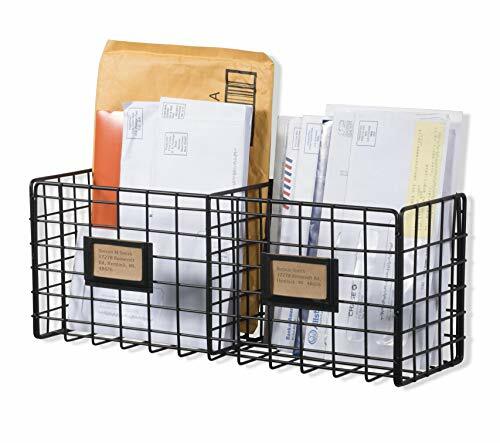 Very Practical: The wire rack is also great for creating a mailbox for small businesses, the name tag slots make it easier for people to sort mail. You can also control your outgoing and incoming mail easier than before. Two side load letter trays, and one tray with a 3 compartments drawer. upright section is with five 2 compartments. 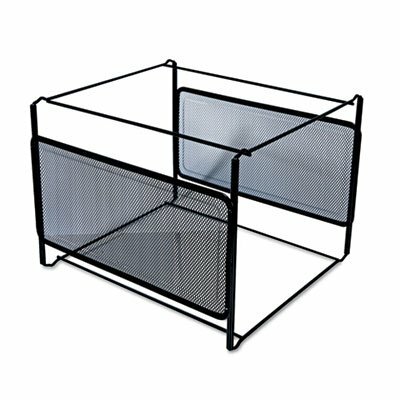 Onyx Mesh 3 Sorter/3 Tray Desktop Organizer is manufactured with strong, commercial-grade steel and a powder coat finish to stand up to years of heavy use. Organizer features three horizontal trays for storing letters, files and loose documents and three 2" wide vertical sorters for folders, binders and notebooks. Place this file organizer in cubicles, home offices, mailrooms, family rooms and kitchens to help declutter surfaces and organize your workspace. The Onyx Family includes a diverse collection of stylishly-designed steel mesh products, from desktop organizers to machine stands. Onyx makes it easy to create a sleek, professional, organized workspace. STURDY CONSTRUCTION. 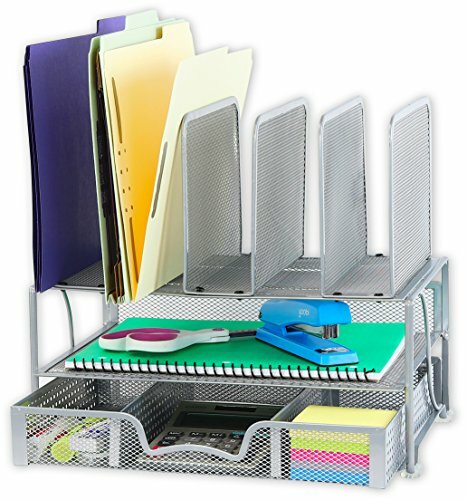 Onyx Mesh 3 Sorter/3 Tray Desktop Organizer is constructed of commercial-grade steel designed for years of heavy, repetitive commercial use. EFFICIENT ORGANIZATION. Three 2 wide sorters make easy work of desktop clutter by organizing important books, projects and binders for quick selection. Three trays conveniently hold mail, stacks of paper, catalogs, folders and inter-office envelopes. BUILT-TO-LAST. The durable, powder coat finish helps resist chipping or scratching while the steel mesh design promotes air flow to help reduce dust buildup. GREENGUARD Certified products are scientifically proven to meet some of the world's most rigorous, third-party chemical emissions standards-helping reduce indoor air pollution and the risk of chemical exposure to help create healthier indoor environments. MAXIMUM STORAGE. Organizer measures 19 1/2W x 11 1/2D x 8 1/4H, making it ideal for large desks, mailrooms, cubicles, common areas, tables and family rooms. No assembly required. Whether you are trying to organize your office or want to hold materials in an effective space-saving manner, try using our wall mount vertical 5 tier document holder! Use for: Literature Marketing Materials Pamphlets Magazines Letters and Bills Files and folders Books Forms and booklets The possibilities are endless, enjoy easy installation, no assembly needed and clear up your space right away. Made from sturdy materials and will not rust. 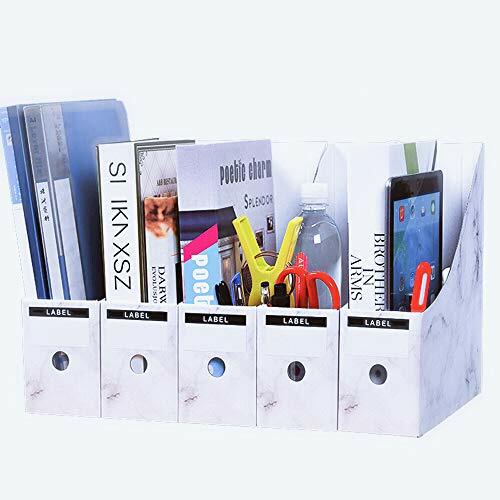 This display wall mount file organizer is just what you need. Save valuable space by organizing your papers vertically and present your literature in a convenient modern way. The dimensions are - 17" L x 12.2" W x 3.7" D. Get yours today! DURABLE ANTIRUST MATERIAL THAT WON'T PEEL- Made of sturdy, high-quality materials and plated with a protective film that will not peel and prevent rust. The black wire mesh has sturdy grade A strength, won't bend easily and will maintain shape. You can trust this unit to withhold many years to come, looking as good as it does from day 1. The wall mount file organizer will support, and the tilt of each tray will prevent your literature from curling up and sliding down. 5 TRAYS TO SAVE SPACE AND FIT ALL OF YOUR STORAGE NEEDS- This 5-tier hanging wall tilted treys have plenty of room to organize your files, folders, books, magazines, mail, literature, and receipts. Ideal storage for A4 papers. Save space and sort your documents more efficiently and esthetically with our 5-tier wall mounted divider. By hanging this unit next to your desk, you can clear up the paperwork off your desk and still have it approachable nearby. This file tray will get the job done! EASY TO INSTALL, NO ASSEMBLY, HARDWARE INCLUDED - the Straightforward assembly that anyone can install. Just use hardware included along with the instruction manual and hang the wall mount organizer in no time. Start using your vertical space within minutes. Once hung, the organizer will not swing or move, it will stay in place. The dimensions are - 17 L x 12.2 W x 3.7 D.
YOUR SATISFACTION IS OUR #1 PRIORITY- We are a small family-run company, and we put your satisfaction first. It's imperative to us to supply high-quality office products that can make all the difference in your space. If you are not 100% satisfied with the 5-tier wall mount file storage, we will exchange it for free or give you a full refund no questions asked! We have a 30-day return policy. Please don't hesitate and try our wall unit risk-free today! Get work done without the stress of a cluttered mess! This Metal Over The Door File Holder from Designstyles is the perfect solution for loose papers and a messy desktop. Two compartments with slots for labels make it easy to store loose papers, documents, notebooks, bills, letter, folders, magazines, books, manuals and so much more! Hang it on an empty wall closest to your desk and have everything you need nearby. When you free up surface space in your office or home things run smoothly and you can focus on the task at hand. PRODUCT FEATURES: 31" x 12" x 6"
Available in Black and Gold MAKES ANY WALL FUNCTIONAL This versatile wall organizer is great in just about any room! It's especially great for small spaces and homes. It's useful in the bedroom, kitchen, bathroom, laundry room, workshop or garage. Use it to store kitchen supplies like towels and cutting boards. Use it to store tools and supplies in your garage or shed. Free surface space in your home and utilize empty wall space. They're already assembled and easy to install so you can start getting organized immediately. It's especially great in offices and art studios. ABOUT US At Designstyles we believe organization and style should be effortless and affordable. So we work to provide a wide range of supplies and organizers that make life run smoothly. With everything from magazine racks to storage baskets, you can depend on our carefully crafted products to keep your home or office neat and clean. We've got everything you need to make things run smoothly in your home or office. Choose style and choose Designstyles! 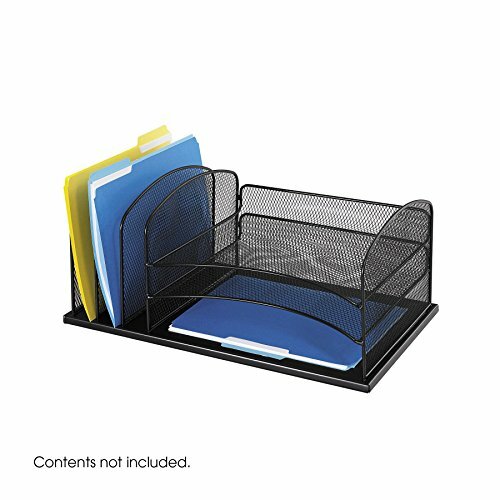 DOUBLE BASKET ORGANIZER: Clear your desk space from loose papers and unwanted clutter. Keep important files, documents and folders neat, organized and away from your tabletops with the help of this hanging wall mount. OVER THE DOOR STORAGE: Hanging is quick and easy with no assembly required. It's ready to install. Utilize empty door space and hang it on the door closest to your desk so that everything you need is always nearby. LONG LASTING & DURABLE: A premium quality metal makes it durable so it can hold as much as you need it too. Don't worry about it breaking or falling because a strong material makes it virtually indestructible. STYLISH DESIGN: A modern look adds a sleek minimalist appeal that fits perfectly in with any home or office d cor. Instantly transform any boring or dull wall space by adding this functional double file organizer. MULTIFUNCTIONAL: It's the perfect way to keep everything in order. Store everything from papers, mail, magazines, books, supplies and so much more. Mount in any room of your home, workspace or office. The pattern is marble and beautiful, the office is fashionable and practical. 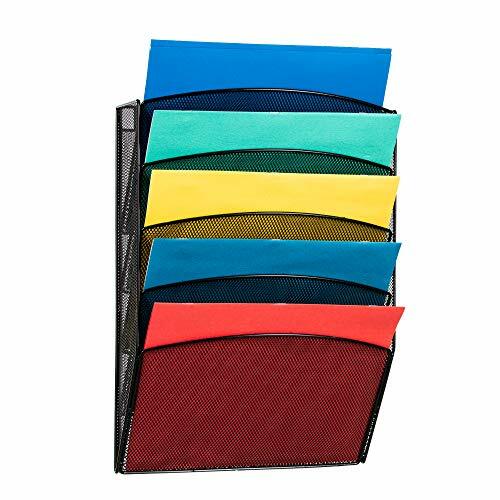 Large Size -The Magazine file holders sized to fit organizing mail, catalogs, magazines, reports, file folders, and more.Depth: 10.6" Width: 3.6" Height 10.6"
Endless Possibilities: These multi-purpose pocket file holders can be used individually or as a stack. You can create a DIY wall file folder units and mount them above or near desk for easy access to all your documents. Organize your space and declutter the piles of paper sitting on your desk to simplify your life and make job easier. Great for Miscellaneous Items: When your daily mail, magazines and misc. stuff end up on your kitchen counter it creates frustration and anxiety. By hanging a wall storage unit like these ones you can now create a home mailing system or a magazine rack and efficiently utilize your wasted wall space and get rid of the clutter sitting on your floors, kitchen counters or cabinets. 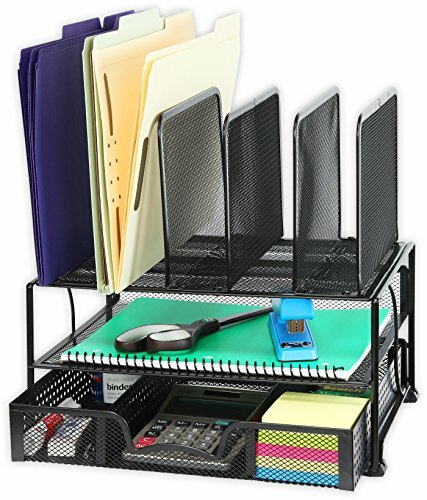 Every office space needs a magazine rack and all students, teachers, medical assistants, doctors, business owners, and other professionals need an organization unit to keep file folders orderly and easy to find. Perfect for Organizing Media Station: With these wall storage units you can now create a space for your remote controls near your sofa or TV. As a student these hanging document organizers will also be your best handy rack and you can tape a calendar over them to stay on task and keep track of due dates. Dimensions: L 6.50" x W 0.80" x H 5.15"
Sturdy structure with a high weight-bearing capability. Made with high-quality, eco-friendly wood fiber: heavy duty, recyclable, environment protecting, good for all use. 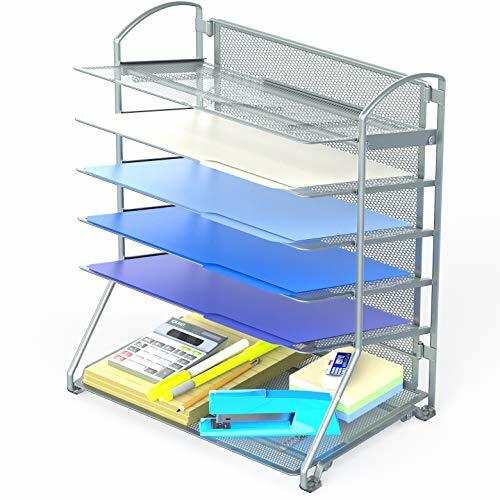 Provides large storage capacity this desk organizer has an overall size of 12.5"L x 9.5"W x 11.2"H. Three upright dividers are used for separating magazines, mails, books, printing papers, small accessories and more. Perfect storage unit for the office, home, college dorm room, school and classrooms. 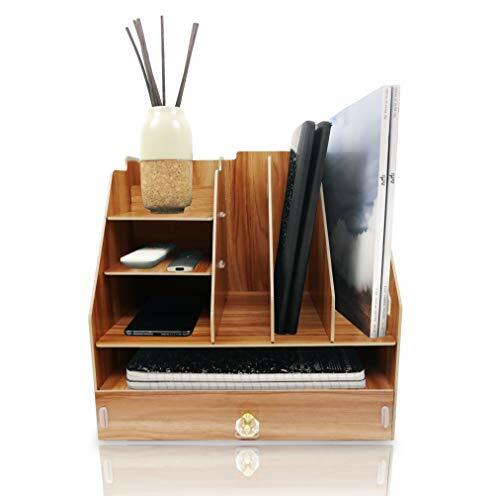 Modern and elegant design Decorate your space with this fascinating slot organizer! A Great gift for school openings, dorm room move-ins, promotions, holidays and all kinds of events. A dorm essential, office necessities you cannot miss. Tools-free assembly under 10 minutes: Comes with both paper and video instructions for easy assembly. Detachable for easy packaging when moving. Enjoy your new organizer! 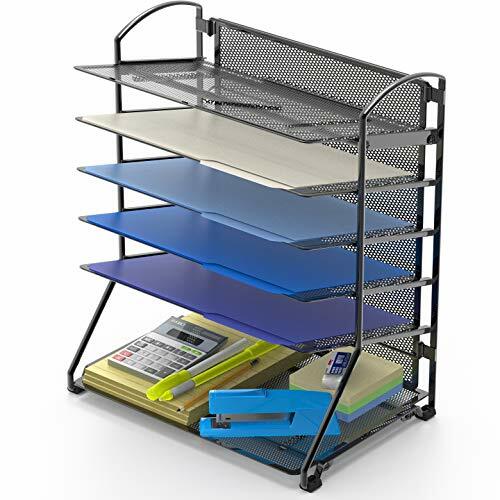 Provides large storage capacity this desk organizer has an overall size of 12.5"L x 9.5"W x 11.2"H. Three upright dividers are used for separating magazines, mails, books, printing papers, small accessories and more. Perfect storage unit for the office, home, college dorm room, school and classrooms. Sturdy structure with a high weight-bearing capability. Made with high-quality, eco-friendly wood fiber: heavy duty, recyclable, environment protecting, good for all use. 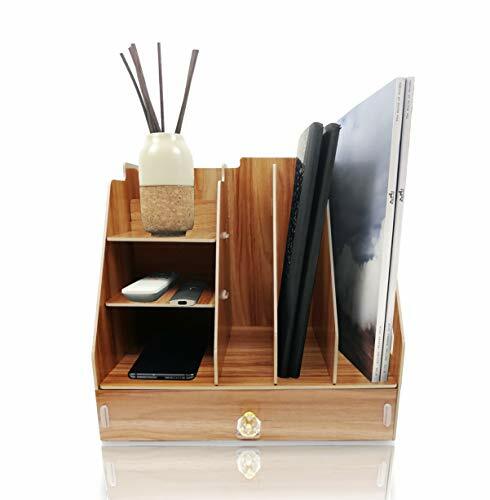 Modern and elegant design Decorate your space with this fascinating slot organizer! A Great gift for school openings, dorm room move-ins, promotions, holidays and all kinds of events. A dorm essential, office necessities you cannot miss. Tools-free quick assembly: Comes with both paper and video instructions for easy assembly. Detachable for easy packaging when moving. Sturdy structure with a high weight-bearing capability. Made with high-quality, eco-friendly wood fiber: heavy-duty, recyclable, environment protecting, good for all use. 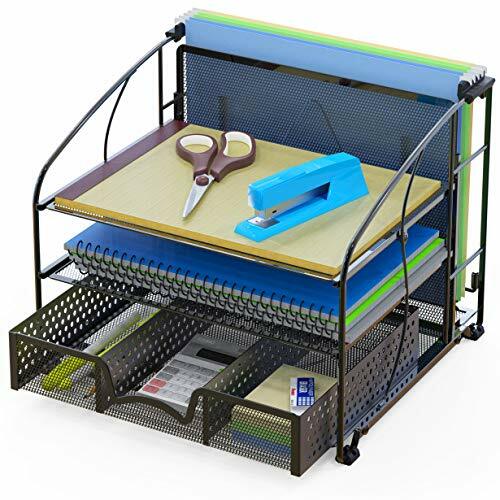 Provides large storage capacity this desk organizer has an overall size of 12.5"L x 9.5"W x 13.5"H. Three upright dividers are used for separating magazines, mails, books, printing papers, small accessories and more. Perfect storage unit for the office, home, college dorm room, school and classrooms. Modern and elegant design Decorate your space with this fascinating slot organizer! A Great gift for school openings, dorm room move-ins, promotions, holidays and all kinds of events. A dorm essential, office necessities you cannot miss. Tools-free assembly: Comes with both paper and video instructions for easy assembly. Detachable for easy packaging when moving. Enjoy your new organizer! 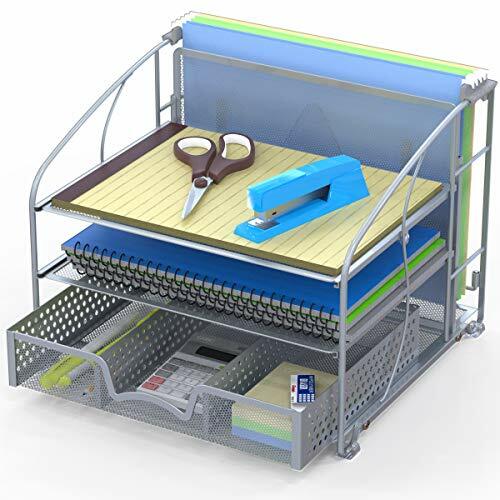 Provides large storage capacity this desk organizer has an overall size of 12.5"L x 9.5"W x 13.5"H. Three upright dividers are used for separating magazines, mails, books, printing papers, small accessories and more. Perfect storage unit for the office, home, college dorm room, school and classrooms. Sturdy structure with a high weight-bearing capability. Made with high-quality, eco-friendly wood fiber: heavy-duty, recyclable, environment protecting, good for all use. Tools-free assembly under 10 minutes: Comes with both paper and video instructions for easy assembly. Detachable for easy packaging when moving. Material: Made of Clear plastic PVC. Size: 25 x 33 x 3cm/9.8x 13 x 1.2in(W x H x bottom size). 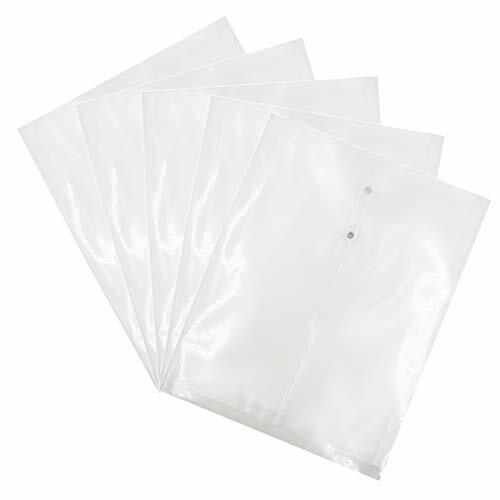 5x White clear file bags. 2) The color maybe a little difference compare the image with actual item due to monitor reflect. 3) If any questions, pls kindly leave us a message first, we will reply you within 24 hours. Package contains: 5x White Clear file bags,It can help you organize your miscellaneous items to meet your daily life and enhance work efficiency. Features: 1. Transparent, you can easily find your files.2. Waterproof, can keep your stuffs clean and dry.3. String closure to keep your stuffs safety. Widely used: The zipper pouch can be used in most occasions like office, business travelling, government office ,home and other place wherever you need. Material: This A4 clear file folders are made of plastic PVC,waterproof, durable and lightweight, easy and convenient to carry on. Size: 25 x 33 x 3cm/9.8x 13 x 1.2in(W x H x bottom size), can store your comestic, stationery,books, files, papers, ducuments, invoice bill check receipt ,tickets, travel accessories etc.